Why did the President attend? There is no better place in the world to identify and meet with industrial leaders who can bring additional jobs, investment and prosperity to America. In addition, for the first time in the Messe’s 69-year history, America was the show’s official partner country. President Obama and various federal agencies used the Messe to showcase America as a place to invest, do business and create jobs. Strategically placed next to the main stage, foot traffic at the Ohio booth was intense for the entire week. 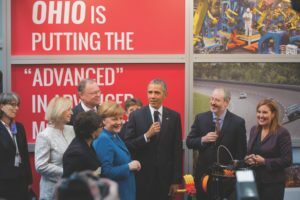 Our JobsOhio contingent had the largest presence of any state at the Messe; more than 100 Ohioans were there to showcase the innovation, business climate, and talent that Ohio offers the world in advanced manufacturing and materials. I represented APEG at the Messe. As a first-time participant, I spent much of my time working the foot traffic at the booth. All told, I returned from Hannover having made 35 promising contacts, some of which have become specific leads with companies that will consider our region for an American location. Part of our strategy is to focus on companies that need the mix of assets that our region can provide – such as our central location, great transportation assets and manufacturing history, workforce and know-how. There is no better place for us to reach industrial companies needing our assets than Hannover. When we return to Hannover we expect the relationships we began to nurture this year to grow, and the opportunities derived from them to multiply. This form of attraction is a long-term strategy that achieves its best results when sustained over time. Like any long journey, you can only reach your destination after you take your first steps down the road. I am glad to say that we are on our way.